At the age of eight, a career in film and television was the goal after seeing TV cameras from Star Soccer, Match of the Day and The Big Match attend Shrewsbury Town football matches. A self-inspired love of filming began with the young teenager frequently seen with a Super 8 cine camera. Although successfull in academic studies at school, sitting behind a desk for a further two years to achieve a place at the BBC Film School was not an option as Matthew pursued his visual talents and gained a place at Art School at the Shrewsbury College of Arts and Technology. Attending A level Photography studies with Group Picture Editor and now Assistant Editor of the Yorkshire Post, Ian Day, the duo gained places on the illustrious NCTJ course in Photojournalism run by Paul Delmar. As other students danced the nights away in the Acid House clubs of Sheffield, Matthew was a regular face at both Sheffield Wednesday and Sheffield United whilst constantly driving up and down the country to follow the fortunes of Shrewsbury Town. Upon hearing Simple Minds for the first time at the age of 9, his passion for Scottish rock music group Simple Minds, became almost a guiding light to someone with utterly no goals or ambitions in life. Although sitting behind a desk accomplishing the academic side of his Photo Journalism studies, the love for instinctive decision making continued. 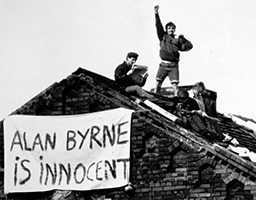 Upon hearing news reports of a prison riot, he joined his two flatmates in Sheffield on the streets outside Strangeways Prison in Manchester photographing prisoners rioting on the rooftops for a number of days. A desire to work for Allsport, and particularly for the same company as his photographic hero David Canon, the offer of a darkroom position with a salary of £4,000 a year was turned down as a decidion to stay in Shropshire paid off. After hearing about a photographer on his local newspaper moving on, a meeting with the editor was immediately orchestrated which resulted 24 hrs later in a company car, all the gear one could wish for and the start of an enjoyable five years working on then one of Britain's best regional newspapers. From following fellow Shropshire Star journalist, Paul Woods - now working for BBC as an international correspondent - to the civil war in Croatia, Matthew returned home when fellow Shropshire photographer Paul Jenks was shot dead whilst working for AFP. At the time, the Shropshire Star was one of Great Britain's leading newspapers and frequently national news story jobs were undertaken including the release of hostage John McCarthy. After years of spending quite literally everything earnt on photographic paper and film, now employed, the next pay packet was immediately spent on following Simple Minds around Europe. After a trip to Paris and then Cologne in Germany to see Simple Minds, this gave Matthew the buzz for travel with a purpose. 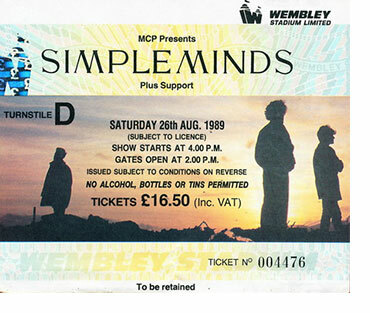 At the time, the only source for tour dates was on a T-shirt and in 1991 after just getting paid again, the idea of seeing Simple Minds once more was too good to forget. After securing the last seat on a flight to Zurich at a cost of £750, the flight was delayed for four hours due to fog. This resulted in only seeing six songs be played at the concert, but if anything this sealed the passion for travel and Simple Minds. A week later after a concert in Hamburg, Germany, not having a hotel and an early flight home, he followed two Dutch girls to the band's hotel. In the next fours hours he befriended his on stage heroes and quickly realised that they were just people with two arms and two legs just like the footballers he knew who others idolised. Another chance meeting, this time on a football pitch, at Gigg Lane, Bury, Matthew sat next to Neal Simpson, then a director of Nottingham-based EMPICS. One thing lead to another and soon pictures were being published in magazines like 90 Minutes, Shoot, Goal and 442 under the EMPICS name. After five years to the day at the Shropshire Star, Matthew left his Shropshire roots and went to Nottingham and began working for EMPICS full time. His first assignment was to take pictures of Danish football team Aalborg who had qualified for the UEFA Champions League. Undeterred at traveling alone in Europe, the first day's work was a pleasant one with half the team being Simple Minds fans! 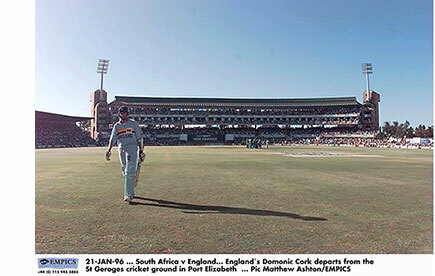 Along with fellow EMPICS photographer Laurence Griffiths, Matthew was one of the first photographers to use a digital camera when he covered the England cricket tour of South Africa, transferring pictures back to the UK by groundbreaking technologies using a mobile telephone. His new employees became one of the first companies in the United Kingdom to get the World Wide Web and with agency boss Phil O'Brien at the helm, new technologies continued to excite him. However it was Simple Minds who were the main influence on his life when in 1995, Matthew embarked on 22 days of touring. This soon grew to 42 and then 52 days as European football fitting in with attending concerts of his favorite band. After a concert in Dortmund, Matthew stayed on in Dortmund and photographed Borussia Dortmund. Another new passion, Borussia Dortmund! Life was not all well though with a dismal photographic display at the UEFA Euro 2006 tournament held in England. This resulted in an even greater desire to work hard and improve if a career in football photography was the career of choice. After an intense 18 months of still trying to perfect his craft, the 1998 World Cup in France was far more fruitful and productive. 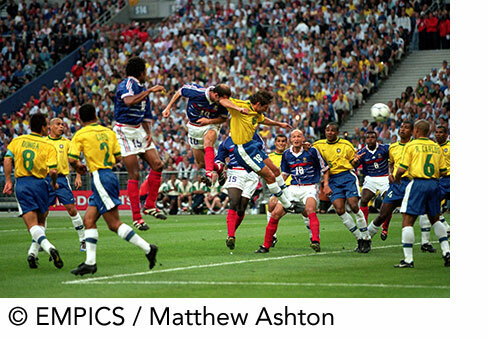 Wearing a Shrewsbury Town shirt underneath his FIFA accreditation vest, he secured a place behind the goal at the final in Paris and captured the two goals scored by Zidane as France gloriously defeated Brazil 3-0. From watching his first World Cup Final, Argentina 78, on a small black and white television, this gave the shy Salopian a much needed confidence boost. Happiness soon turned to sadness as whilst on a road trip to Rome and then Monaco, camera gear totalling £35,000 was stolen from a hire car whilst visiting an Italian friend who ran an Ice Cream shop. Although then one of the highest paid football photographers in the UK, most of what was earned went back to paying off the stolen cameras as well as paying for new ones. Whilst most of his colleagues were purchasing multiple houses during the property boom, Matthew still lived at home and living out of a suitcase! It was in May 1999 that Matthew endured one of his toughest but most epic 24 hours in Barcelona, Spain. Before the UEFA Champions League Final he experienced disaster after disaster. From having a scooter undertake him resulting in a major accident in the middle of Barcelona city centre - leaving him very late for training, along with other photographers, Matthew then had his car towed away after local Police acted upon wrongly errected no parking signs for the impending final the next day. On game day he forgot to charge his camera batteries and whilst in the stadium somehow forgot to take with him a bag containing 15 rolls of film for the second half. However upon scoring the end of game winning goal for Manchester United, Ole Gunnar Solskjaer thankfully ran straight towards Matthew and whilst working with fellow EMPICS photographer Michael Steele, the pair gained global notoriety for capturing Manchester United's historical victory. At the turn of the millennium, Matthew began taking pictures for Simple Minds becoming personal friends with his favorite rock group. For all his football achievements, seeing his photography used by Simple Minds for tour posters, concert tickets, tour brochures, a collection of CD single covers and live material used on the official bands website, remain the most cherished. His love of Japan started in 1996 when he followed Luis van Gaal and his Ajax team to Tokyo for the Toyota South American / European Cup. Frequent trips to Japan followed, with a cherished nine weeks of documenting football stadia being built whilst traveling on the Shinkansen Bullet Train for the impending 2002 World Cup. Lifelong friendships with many Japanese photographers began, with the World Cup itself being personal career highlight - especially when spending frequent travel days with his teenage hero David Canon. Following David Beckham became a habit. From documenting his epic signing for Real Madrid, his images were used in David's Autobiography. Matthew subsequently documented the fortunes of Beckham during his career at Los Angeles Galaxy, AC Milan and Paris St Germain and in more recent times covered David's UNUCEF charity game at Old Trafford where his son, Brooklyn, played alongside him. Settling down though was not an option and although the prospect of teaming up with another agency and working with Manchester United never materialising, as EMPICS were the official photographers of the UEFA Champions League, this took up most of his working life and with assignments for FIFA beginning to be undertaken there was no need to look elsewhere for future challenges. His time at EMPICS was up however when owner Phil O'Brien sold the company to the Press Association. Late 2005 saw severe differences in business strategies and direction. Coupled with a polar change of direction in how the agency covered events, this pushed him to the realisation and accepting that it was time to move on. After a season freelancing, AMA Sports Photo Agency was born in 2006. Helping instruct Catherine Ivill to transform her nursing career to a football photographer whilst working alongside fellow Salopian Sam Bagnall, AMA soon became a recognised outfit supplying images to national newspapers. With a dying magazine market, AMA quickly changed direction and became the official photographers for three football clubs whilst Matthew continued his passion for traveling and documenting football on a global scale. Following in the footsteps of his EMPICS agency boss, Phil O'Brien, AMA created a new online archive which opened the eyes of onlookers. AMA teamed up with Django coder Richard Price to create an innovative, bespoke online archive and syndication system from scratch. Now in his 40's his passions for Japan, Simple Minds and Shrewsbury Town never seem to decrease. Matthew's work has featured amongst others in hunderds of leading publications and newspapers including Sports Illustrated, Stern, LA Times and the Yomiuri Shimbun. Commercial clients have included Adidas and the Japan Football Association. However his desire to meet new people and reach out to new clients with new techniques and ideas results in newly found busman's holiday approach of freelance work for various clients including MOTIF creative based in Nottingham. as well as being a member of the official photography team at Crufts, to undertaking Corporate Golf Photography for the likes of Zoopla and Amps on various famous golf courses.